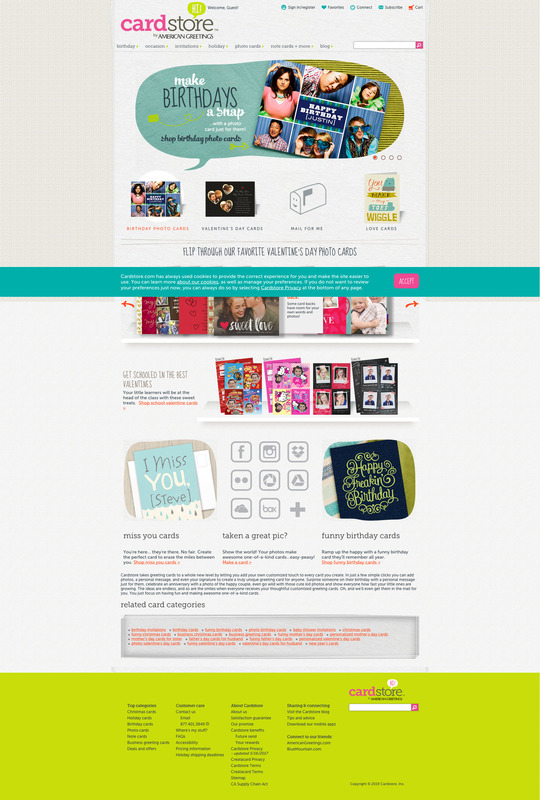 Cardstore allows users to personalize thousands of one-of-a-kind greeting cards with text, photos, and personal messages. 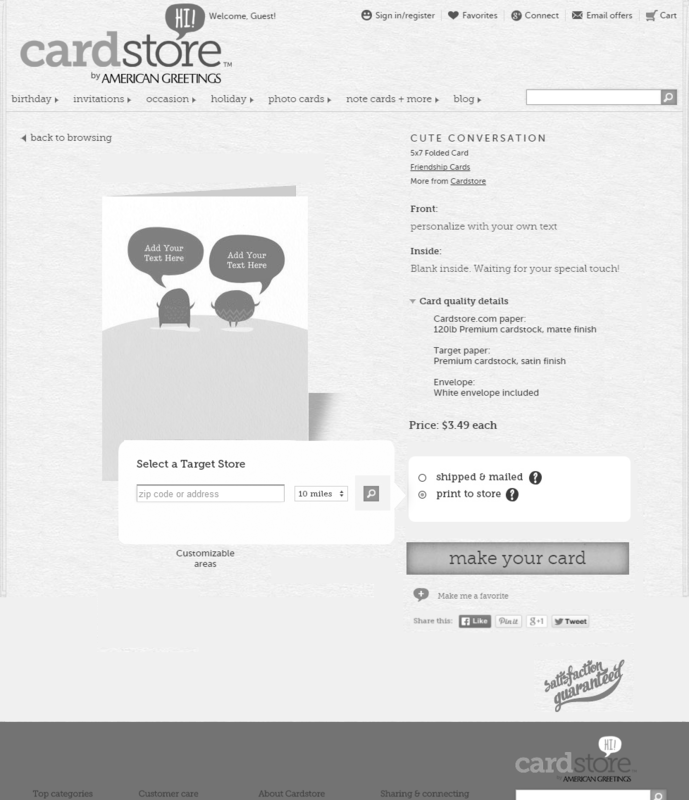 Cardstore serves customers by printing and mailing cards on their behalf. Find a card, personalize that card, add a name, address, and send it. Within a week, your physical card is delivered. 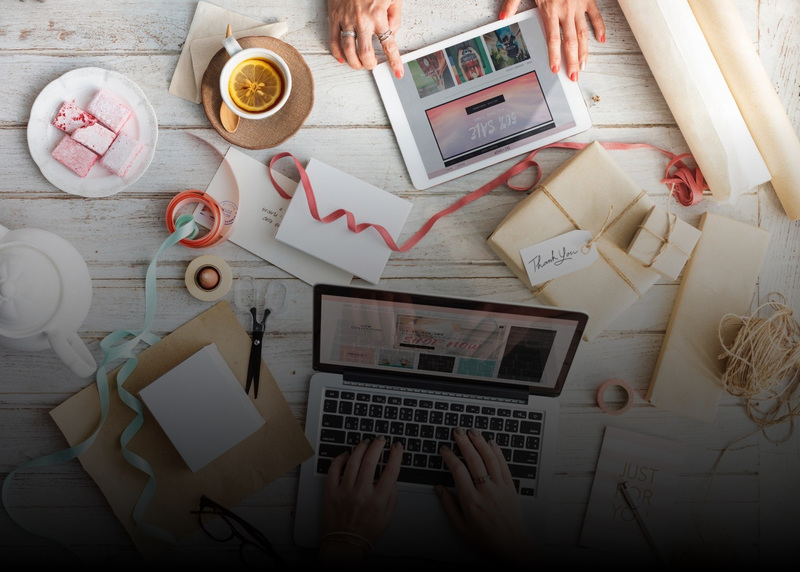 To meet the demands of an ever-changing marketplace, we decided to partner with Target. This partnership would potentially give users the opportunity to print their personalized greeting card to the store and pick it up the same day. Last minute card senders rejoice! 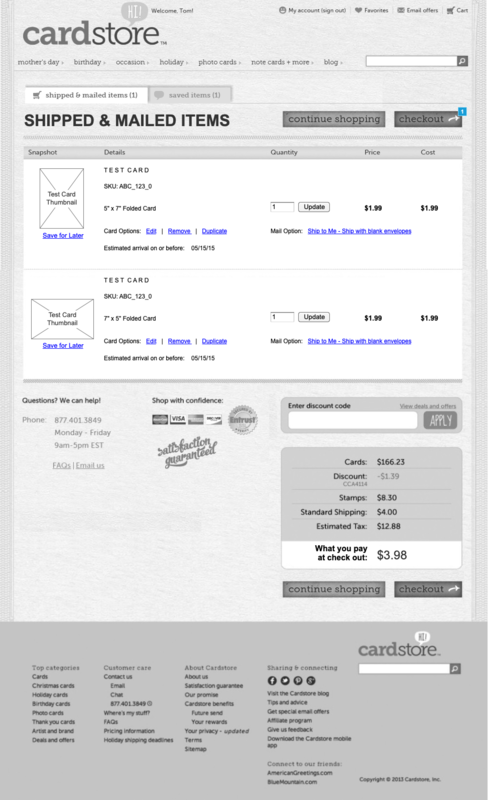 We needed to combine the print-to-store capability with the existing card-sending features on the site. Given that this experience reached in to physical storefronts, it was more important than ever that we actively collected user feedback along the way. My main objective during primary research was to gain empathy for our users. We already knew that the majority of users purchase a greeting card relatively close to the respective holiday. Through initial user interviews, we discovered that several of our users were frustrated that they weren’t able to get a card FAST. And by fast, I mean within a day or two. With our current experience, users needed to purchase and send a card at least a week before their respective holiday. 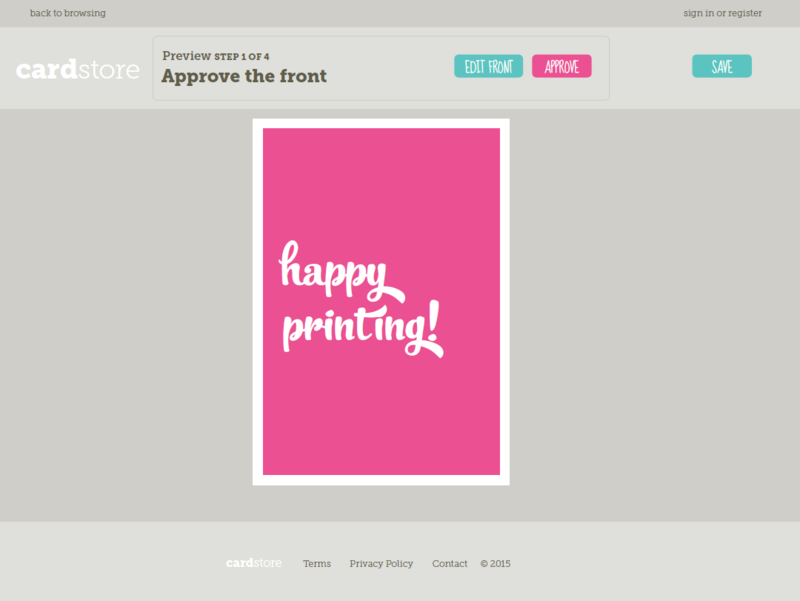 By introducing ‘print-to-store’, users would be able to select, customize, and professionally print a card the same day. We found that this feature was highly desirable. We also discovered that most of our users had a Target storefront within a reasonable driving distance. 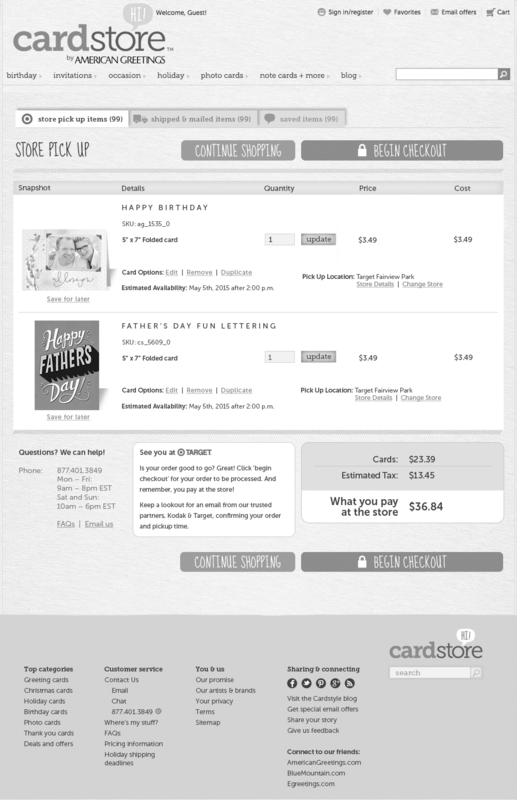 All of our users were willing to make the trip to a Target store to pick up a professionally printed greeting card. Since we had a solid understanding of our target demographic and user personas from prior projects, we decided to create a user flow to help us better understand the experience from beginning to end. Once we took an initial pass at our user flows, we needed to create something tangible for our users to test. We explored screen designs through sketches, then quickly moved to mid-fidelity wireframes. Since we had access to site assets, we presented little risk in creating mid-fidelity designs earlier in the process than usual. 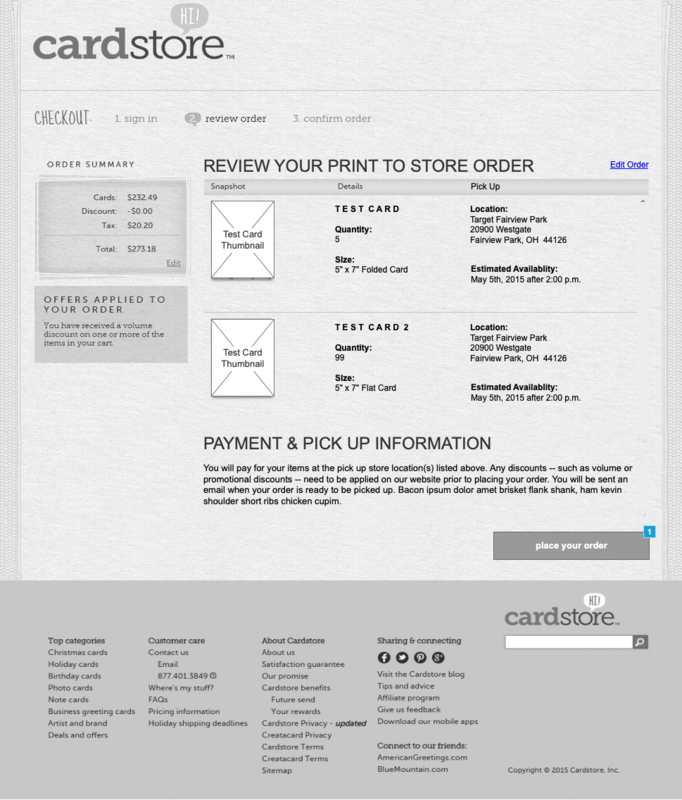 We needed to learn if our users understood that they had the ability to print a card directly to a storefront. We also needed to test if selecting a store functioned as expected. The experience of designing a card was largely unchanged from the current experience. Even though changing the experience of designing a card was out of scope, we still wanted feedback on the experience. It was important that we clearly understood if we were missing any nuance in tying the entire experience together. Although our experience tested relatively well, we needed a better way to help our users understand that the design they saw on screen would (or wouldn’t) print exactly as they saw it. We printed several card in store to make sure that cards were printing exactly as expected. To our surprise, some of them weren’t. It was great that we were able to discover this nuance early in the design process. Although this likely would’ve been discovered closer to launch, we were able to pinpoint a problem, and fix it in our designs before causing any rework later in the process. To compensate for this problem, we updated the card design flow. We made sure to show clear borders throughout the design process so that users knew what would and wouldn’t print. We also introduced additional friction in the process by way of confirmation dialogs. It was important that users wouldn’t rush through the flow only to discover their printed card wasn’t to their expectations. The entire experience was tested again for good measure and was just as successful the second time around. 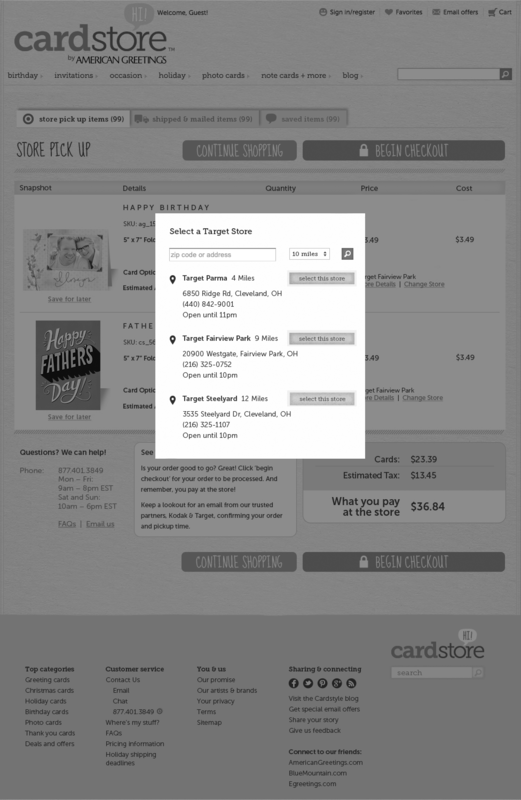 We created the ability for user to print cards directly from the browser, to their nearest Target store. We mapped the entire experience, tested and interviewed customers, and felt confident that our MVP was ready for showtime. The whole process took us less than 3 months. We needed to conduct additional rounds of in-store testing. Several more cards needed to be printed to ensure accuracy and effectiveness. We also needed to review the customer experience beyond the purchase. 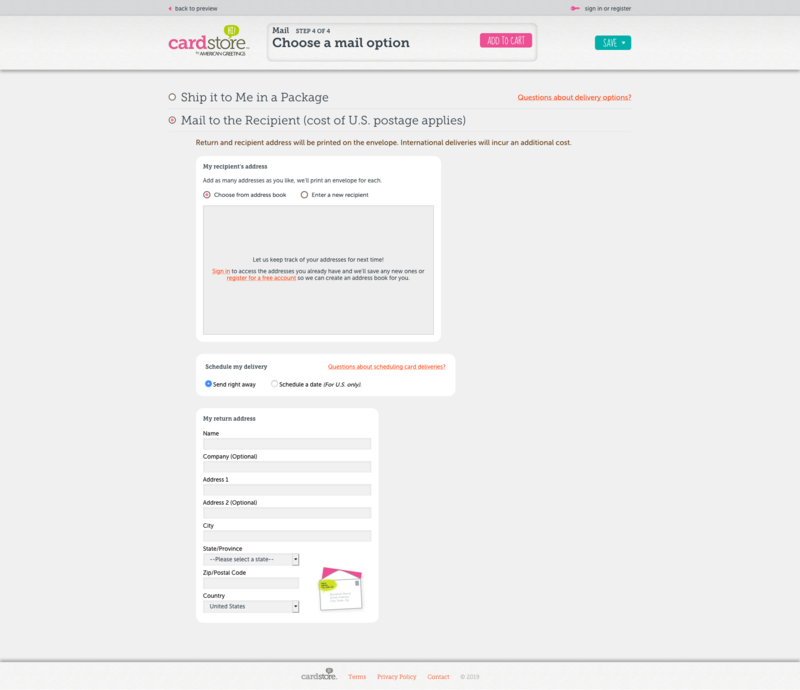 For example, what if a user needed to return the product? What if their card didn’t print as desired? Although there were policies in place to address these concerns for launch, we needed to make sure that the experience was frictionless from beginning to end.